Missing A Tooth? Every Tooth Counts! 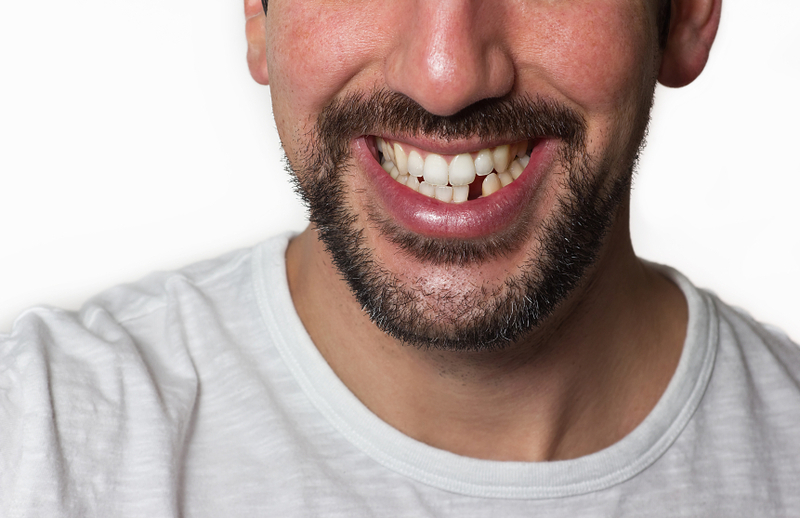 It’s normal to be confused about your dental options when you lose a tooth, but the team at McArthur Dentistry in Lakewood can help. If you are missing a tooth, we suggest replacing that tooth with a dental implant. Missing teeth can cause a number of problems for people of all ages. Besides the obvious impact missing teeth can have on the cosmetic appearance, there are a variety of other important reasons to replace a missing tooth. Missing even a single tooth can have a large effect on the remaining teeth. When a tooth is missing, the biting force on the remaining teeth begins to change. As the bite changes to compensate for the lost tooth, there is a risk of extra pressure on the jaw joints, which can lead to TMJD (temporomandibular joint disorder) related issues such as jaw soreness, neck pain, and even headaches. If a missing tooth is not replaced, the surrounding teeth are likely to shift around the empty space, creating gaps, and uneven spacing. These shifting teeth then are at a higher risk for plaque buildup, which can lead to cavities and periodontal disease. Dental implants are typically the most recommended option by dentists for replacing teeth. Compared to traditional replacement options such as dentures or bridges, dental implants are designed to look, feel, and function the most like your natural teeth. The benefits of dental implants can extend to individuals who are missing one tooth, several teeth, or even all of their teeth. 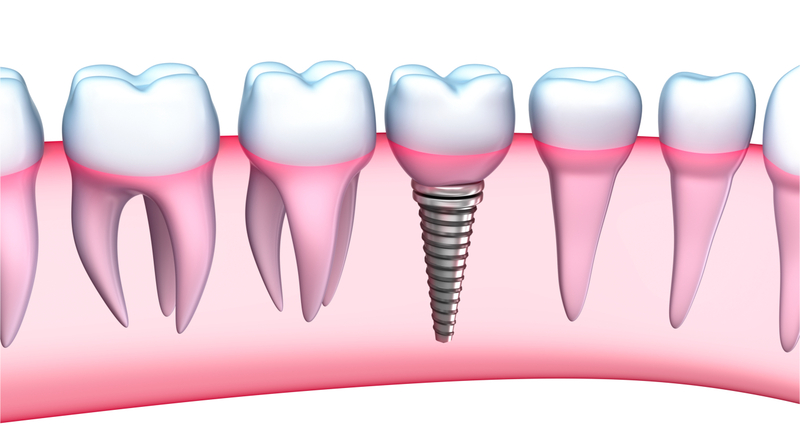 The implant body, which resembles a tiny screw, is surgically inserted into your jawbone below the gum line. It essentially serves as an artificial tooth root, becoming a permanent and secure base for one or more artificial teeth, called dental crowns. Made of a durable bio-compatible titanium, over time the implant body will fuse to the jaw bone; actually stimulating bone growth while offering a long-lasting solution to a missing tooth. This second portion of the implant is a small part that connects to the implant body. Generally, the abutment is connected to the implant after it has fully fused to the bone. This typically takes around 3-6 months. The abutment will screw right on to the implant and will sit right at the gum line. This is the part that will support the replacement teeth. The last step is a custom-made artificial porcelain or ceramic tooth- which can be an individual crown, implant-supported bridge or dentures containing multiple replacement teeth – that is attached to the abutment. These new teeth, which look and feel like natural teeth, are color matched to blend in with your existing smile. Comfort & Durability: Dental implants offer incomparable comfort and durability as a tooth replacement option. Gum discomfort with dentures is common. Since they are not permanently fixed to the jaw, dentures tend to shift and rub gums painfully. Additionally, dentures and bridges cannot withstand the chewing force that natural teeth or dental implants can tolerate. Therefore, they often result in people having to avoid a variety of food items, which become hard to chew or could be damaging to the tooth prosthetic. Esthetics: The crown, or artificial tooth, portion a dental implant is custom-made to match the color of your existing teeth. 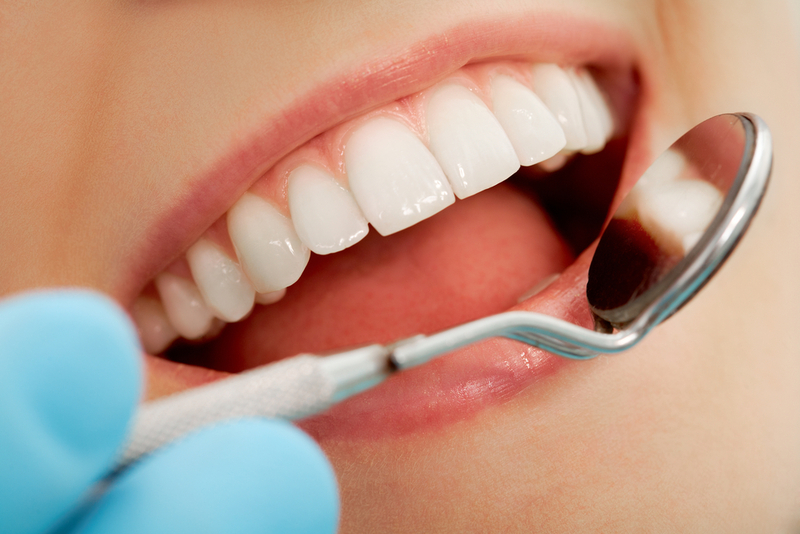 Implants are known to blend perfectly with natural teeth, restoring the appearance of a beautiful and healthy smile. Bone Health: Dental implants are the only tooth replacement option that preserves natural bone, actually helping to stimulate bone growth. Without this stimulation, the jawbone would eventually shrink away or resorb into the body. This is often the case after years of wearing a partial denture or a dental bridge. Versatility: Dental implants can be used to replace one or more missing teeth. For patients missing one tooth, a dental implant can restore function, structure, and support to the smile. For patients missing multiple teeth, a dental implant can create another layer of support for dentures or a dental bridge. These advantages, along with several others, give dental implants as a tooth replacement option an excellent long-term value and can be a great investment in one’s long-term oral health. If you would like to explore your tooth replacement options or determine if dental implants are right for you, contact Dr. Lueck at McArthur Dentistry to schedule a consultation. No two patients or their customized dental implant treatments are exactly alike. After an initial consultation, Dr. Lueck will provide you with a treatment plan including the estimated amount of time to complete the process as well as the cost.